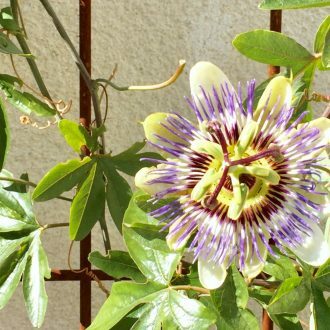 It may not be the best photograph in the world, but our beautiful Passion Flower is shown here growing up our Contemporary Trellis Panel. This fine specimen was given to us as a cutting from our good friend Clive and has thrived in one of our zinc galvanized troughs. Our Passiflora Caerulea is filled with Christian symbolism and is a wonderful addition to any garden, so why not pay a visit to your local garden centre this weekend and treat yourself to a seasonal delight (or find a friend called Clive and ask him for a cutting!). We hope you all have a peaceful and Happy Easter, from all of us at Garden Requisites.